A most remarkable thing happened recently. No, I don't mean the sudden resignation of EAA president Rod Hightower. I refer to a recent (September 27, 2012) approval of a brand new Special LSA. Why is that noteworthy, especially as it is #128 on our SLSA List? Everyone in the business of LSA and most other alert readers have followed the long, winding, still-evolving path of FAA approvals in the fall of 2012. Specifically, FAA has released an order that says any new model from an existing LSA supplier or any LSA from a new company must be blessed by FAA headquarters in Washington DC. The Aircraft Certification branch must be informed first and an inspection judged necessary cannot be done by a DAR (Designated Airworthiness Representative... the people who have approved all other nearly 3,000 LSA in America). Under the new dictate, any new-model approval must be done by an FAA Air Safety Investigator. In short, it ain't easy. Nonetheless, Ed Pitman of Pitman Air accomplished the daunting task. To my shocked inquiry, Ed (an old friend from my hang gliding days) wrote, "Yes, it is true, the FAA did it. Rather than send a team, [due to] 'lack of funds' they sent their top gun from the Seattle regional manufacturing office. FAA-ASI Michael Bramble is highly qualified (and pretty busy), having issued the first Boeing 787 Standard Airworthiness on September 17, 2012. Immediately afterward he went to nearly the opposite end of the aviation spectrum. Ed continued, "Then [he did] mine on Sept 27th 2012. Poor Boeing had more than 60 competed 787s waiting for that Airworthiness." Despite Bramble's obvious credential, it was still arduous gaining the new SLSA certificate in this environment. Ed went on, "He was constantly on the phone with DC and Oklahoma City. He spent several months going over my documentation against [the July 2012 FAA order called] 8130.2G CHG1 and I think he had a lot of coaching from DC." FAA may have worked hard to get this done but so did Ed. "I worked on this for 22 months to make it happen," explained Ed. "I went to Australia [where the design is now owned] for a month in March this year to insure they had their paperwork and processes in order. I advised Bill Moyes in the beginning that because of the bilateral agreement between U.S. and Australia he could run everything from Sydney, but he chose to have me represent America for the Dragonfly." 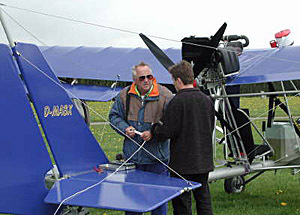 Thus, Pitman Air is the official manufacturer of the Dragonfly SLSA and ELSA Kits. 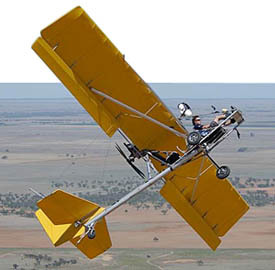 Americans can still buy Experimental Amateur Built kits directly from Australia but they cannot tow hang gliders or teach in these machines. According to FAR 91.327 the SLSA models can be used for "Compensation or Hire" for both aero towing and flight training. However, Ed reports he is working to obtain a waiver from FAR 91.309 to solve remaining issues. Presently Pitman Air offers the 65-hp Rotax 582-powered Dragonfly but Ed reported that designer Bobby Bailey will start work in November to build the first Dragonfly 912 ULS... "so I can get that added to the list before spring." The magic of the Dragonfly is that it was specifically designed to aero tow hang gliders at the speeds hang gliders want to fly: 30-35 mph. Therefore Dragonfly was created with huge ailerons and a large tailplane that work at these speeds. It also has a special rig on the tail that permits towing of a weight shift aircraft. After tugging a one or two-person hang glider aloft, the glider pilot cuts loose the towline (which trails after the Dragonfly) and the tug pilot will dive back to the ground to get another glider. Nose down steeply, Dragonfly won't exceed about 55 mph. The purpose-built design has done workhorse tractor-like duty and some of the fleet of Dragonflys at the popular Wallaby Ranch a few miles south of Disney World reportedly have upwards of 10,000 hours on them. Congratulations to Ed for his incredible perseverance and to FAA's understanding that Dragonfly is a critical aircraft to modern aerotow-launched hang gliding.